Outsound New Music Summit: Guitar Night! The 2014 Outsound New Music Summit continued last Thursday with night featuring guitars, and only guitars. This was an unusual curation for a concert of new music, and generated some lively and amusing discussion during the pre-concert Q&A. The concert itself opened with a solo set by Henry Kaiser. He performed on an instrument that he had never used before, or even plugged into an amplifier before the set began. He opened with a simple piece directly into the amp that was quite pretty, with lots of harmonic and melodic sounds punctuated by percussive moments. 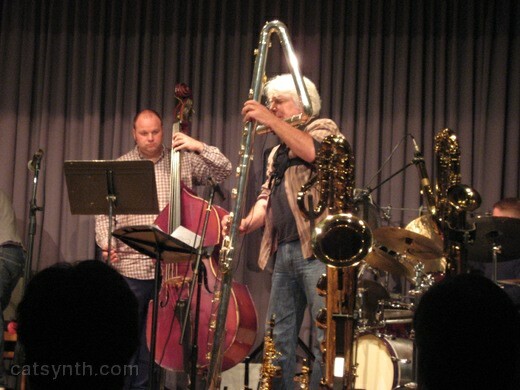 But it was when he added his effects that things because more interesting, with very lush sounds and intricate patterns of delays and loops – not the simple looping harmonies one often hears but complex textures reminiscent of improvising ensembles. Next up was a duo featuring Sacramento-based guitarists Ross Hammond and Amy Reed. Their set featured a wide range of sounds and styles, some quite idiomatic drawing on the artists’ blues and folk roots, some much more experimental with extended sounds techniques, and some quite noisy. Particularly memorable moments includes drones that were interrupted by higher scratchier sounds, and the final acoustic traditional song sung by Reed. Hammond and Reed were followed by another duo, John Finkbeiner and Noah Phillips. At once one could tell theirs would be a different sound, heavier and a bit more aggressive. There was a lot of fast playing and use of percussive and prepared techniques. The music never really settled down, which I suspect was the intention. I liked a lot of the electrical and “beyond guitar” sounds they were able to achieve. The final set was also a duo, this time bringing Houston-based Sandy Ewen together with Jakob Pek. From the start, this was the most avant-garde of the sets, with both performers placing the guitars in their laps, and bowing or striking the instruments. This was a beautiful and captivating set, with dramatic changes in texture and technique. There mere many long tones but also moments that were very sparse and quiet. They kept the listeners on edge with strange and eerie sounds combining guitar strings with rubber balls, steel wool and other elements, but their gentle intensity also kept us drawn into the performance for the entire duration. Overall, it was an interesting night, with quite a range of music from a single instrument. All of the artists took us far beyond the typical stereotypes and expectations of the guitar and showed us a lot more of what it can do in the right hands. 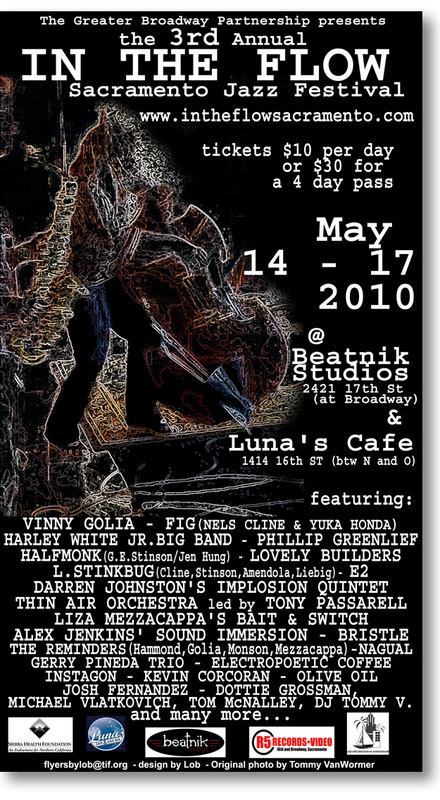 Our next Reconnaissance Fly gig will be here on May 15. We will be performance in the festival on Saturday, May 15, at 1PM at Beatnik Studios, 2421 17th Street @ Broadway, in Sacramento. Too bad we’re not at Luna’s Cafe. This is the debut of our new quartet lineup, featuring myself, Polly Moller, Tim Walters on bass and electronics, and Noah Phillips on guitar. We have been perfecting our “Flower Futures” cycle featuring spoetry (poetry based on spam messages) and taking advantage of the sonic and musical options of our expanded lineup. So if you are in the Greater Sacramento Metropolitan Area (?) on the 15th, do come check it out. This performance, entitled FUEL, was part of the Containment Scenario performance series “which explores the current environmental situation through the lens of improvisational music-dance-theater.” This was the third part of a five-part series adopted from the book Containment Scenario: DisloInter MedTextId entCation: Horse Medicine by M. Mara-Ann, who also directed this performance. This was a multimedia piece with voice, text, instruments, dance and reactive video (Luke Selden). 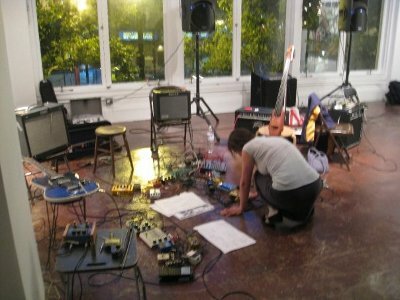 It began with the vocal leads (M. Mara Ann and Sarah Elena Palmer) sitting down in the front of the stage with computer printouts, loudly ruffling and connecting them up with packing tape. As video of bucolic grass scenes and a close-up of a human are projected on the walls behind them (and onto their reflective white dresses), we hear their voices come in, speaking words disjointed and percussively. The voices gradually become more melodic, but all the while the “paperwork” continues. 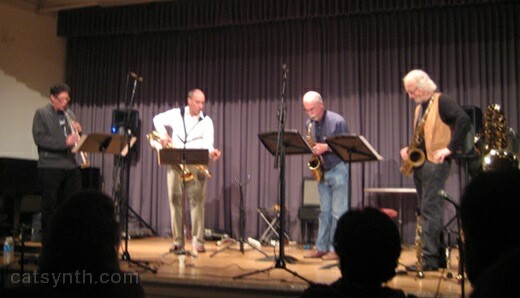 The other performs move slowly onto the stage, all wearing white shirts. As they take their positions, first the guitar (Noah Phillips), then the electronics (Travis Johns), then violin (Emily Packard) and percussion (Anantha R. Krishnan) all came in. Musically the texture remained very gradual, interspersed with vocals, though the words became clearer and louder over time. This was aided by the fact that the text (presumably from the Containment Scenario source) became synchronously part of the music and the projected media. Text scrolling by on the right video projection was recited in various musical styles, harmonic, percussive, expressive, while the vocalists took turns typing their words into a laptop that would project onto the other screen, sometimes mixed with other videos. During this section, the instrumental music was much more sparse, often silent as the written and spoken words became the focus. Later textual recitations returned from the video to the computer printouts. At times the words came out as whispers, sometimes more melodically, with the instrumentals returning into the mix. As the performers moved around the stage, there were dramatic visual moments where they became part of the video projection, their white shirts and dresses becoming screens on which the video was reflected and distorted and combined with the flat background. The dancers (Julie Binkley and Rebecca Wilson) eventually took the printouts used for the back screen and began to wrap each of the musicians in a cocoon of paper. First Travis Johns on electronics was encased, then the each of the others in succession, eventually binding the two vocal leads into a bundle of their own printouts. The piece concluded with the dancers bringing out large number signs (I’m not sure what these were about), and handing them to the vocalists, after which the sounds and words gradually stopped. 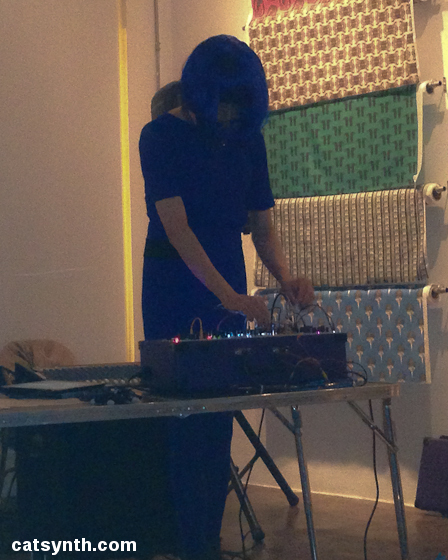 The performance of Containment Scenario: FUEL was preceded by two fun sets of improvisational music. The first set was by Drew Ceccato, playing an electronic valve instrument (EVI) by Steiner and an analog synth by Crumar – a beautiful and intriguing instrument. The set began with a low rumbling, which joined with “watery” sounds and pitch modulation expressively controlled by the EVI to create a subtle rhythm. Over time, this become louder, with wider pitch modulations, beating, percussive sounds before returning to the low rumbling. 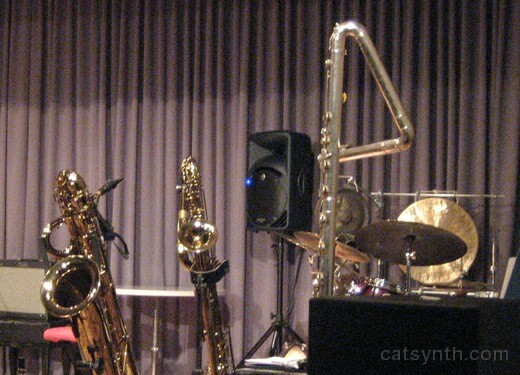 The music then changed completely for more traditional “analog sounds” with traditional pitched notes, like a conventional wind instrument, though with extremely high pitches at times. It was a very brief, and very intense set, without a moment wasted. 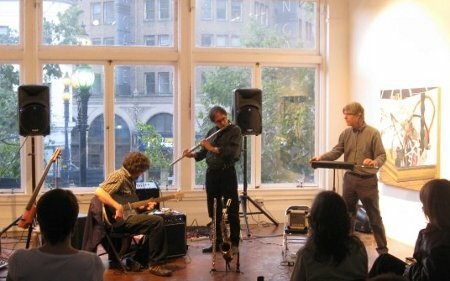 Ceccato was followed by a duo of Gino Robair and Christopher Riggs who was playing “guitar and a box of cool looking stuff”. Of course, Gino Robair had his collection of cool stuff as well, analog synthesizers along with metallic resonant objects and various means of exciting them. It started with a metallic roar, which I believe was created by Riggs’ rubbing the guitar strings. This was combined with the chaotic sound of the Blippo Box and other synths. The two performers appeared to come to an equilibrium of sorts, with sounds repeated and played off one another. Indeed, it was sometimes hard to tell who was playing what sound – and this is a good thing. 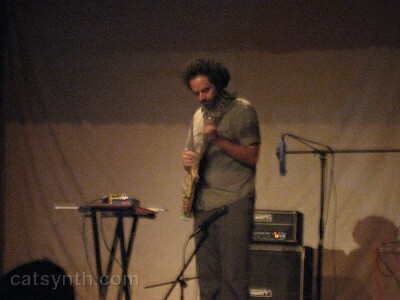 Robair moved on from the synths to cymbals, with loud dramatic resonances set against the guitar rhythms. 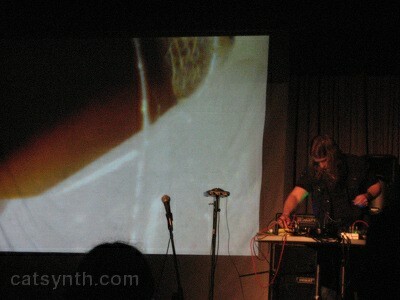 I heard a plaintive brass synth set against a more “chattery” guitar; a styrofoam instrument that was “insect-like” in both its appearance and sound; a funny voice vaguely like throat singing made with a tube and a coffee can; and more metal objects excited by motorized fans crawling along the floor. After a climx with angry resonances and a metal on metal thud, lots of motion, convulsing and fast scraping, the sounds faded out. The turnout for this particular evening was quite impressive, it seemed that all the seats were filled, even the extra “kiddie seats” that the folks at the Luggage Store often put out.